Chefchaouen or Chaouen, as it is often called by Moroccans, is a popular tourist destination given its proximity to Tangier and the Spanish border. The name simply refers to the shapes of the mountain tops that tower over the town, that look like the two horns (Chaoua) of a goat. 'Chef Chaouen' literally means 'look at the horns'. In this tiny mountain village in order to host the summer influx of European tourists. One distinction possessed by Chefchaouen is its blue-rinsed houses and buildings, a tradition that comes from the town's former Jewish population. traditional Andalusian house in the old part of town, the Medina. It has 13 spacious rooms, all with new beds. Guests can enjoy themselves in two living rooms, with sofas and tables. Enjoy a film in the TV/DVD room, or read books and surf our mega-fast internet, in the reading lounge. Our facilities include 4 Bathrooms with 4 hot showers 24 hours a day. 3 common rooms (Music lounge, TV/DVD area, reading lounge), and free use of the kitchen. Guests can also use a spacious terrace, even for sleeping under the stars (45 DH), but only in summer time, of course. Our staff speaks, beside Arabic and French, also Spanish and English. Directions to our property: from bus station u can walk to the centre of city named BAB al AIN (where is the post office and banks) when u arrive there u will see in front of you an old door to get u in the old midina (old city) just walk up strait on the right then you will see our sign PENSION SOUIKA. NOTE:Please be advised we at souika will respectfully honour you reservation if you expect to be later than 2 hours past your indicated arrival time. 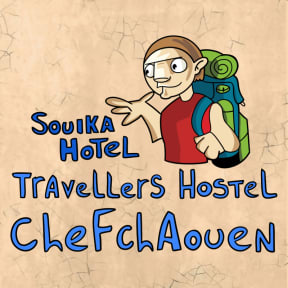 We kindly ask that you notify us at Souika if you are going to be late so we can ensure your room is available upon arrival. If we are not advised about your late arrival we regrettably cannot guarantee your reservation. Please be advised you will be charged one nights stay if you do not show up or if you cancel less than 48 hours in advance.